If you are looking for NYC Dental Implants in Manhattan, 286 Madison Dental provides some of the best cosmetic dentistry in the city. Our implants act as titanium roots to replace missing or damaged teeth. Every tooth has two main sections, the crown and the root. The root is the section of tooth that is just below the gumline. When a tooth is lost or extracted, our New York dentists will utilize a dental implant to act as an artificial replacement for the root. In 1952, Swedish surgeon Professor Per-Ingvar Branemark conducted research into the healing patterns of bone tissue. Branemark accidentally discovered that when living bone tissue comes into direct contact with pure titanium, the two will grow together and form a permanent biological adhesion. This phenomenon was named “osseointegration”, which became one of the backbones for modern cosmetic dentistry. 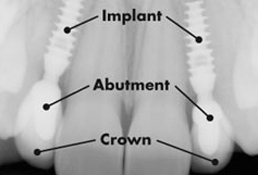 Today, bridges and crowns placed on dental implants should look and feel like your own teeth. Our NYC dental implants have become the gold standard of care. No longer are implants considered “new” or “experimental”. Numerous studies have shown that the success rate for modern dental implants is as high as 98%, with little to no discernible bone loss.In the hands of our trained New York dentists, dental implants are a safe, predictable, and preferred alternative to old-fashioned bridges and dentures. HOW DOES DENTAL IMPLANT TREATMENT WORK? Dental implant treatment consists of two phases: a Surgical Phase and a Restorative Phase. During the Surgical Phase, the dental implant is properly positioned in your jawbone. It effectively replaces the root of the missing tooth and fuses with the bone in the process of “osseointegration.” Our advanced NYC dental implants are not susceptible to periodontal disease or tooth decay. These new implants are considered permanent and can last a lifetime in many cases. The Cost: While the cost of implant treatment depends upon the type and number of implants placed, the replacement of a single tooth with dental implant treatmentcosts about as much as a dental bridge. A dental bridge necessitates “cutting down” adjacent teeth (even if they are absolutely healthy) for crowns. With dental implant treatment, there is no need to damage teeth that do not need any treatment. • With a bridge, some of the bone that previously surrounded the tooth begins to resorb (deteriorate). Dental implants integrate with your jawbone, helping to keep the bone healthy and intact. • In the long term, a single implant can be more aesthetic and easier to keep clean than a bridge. Gums can recede around a bridge, leaving a visible defect when the metal base of the bridge becomes exposed. There is good news for denture wearers; even complete dentures can now be supported by implants in what is called an implant supported denture (also known as an overdenture). • Edentulism (missing teeth) contributes to bone loss, making the “fitting” of traditional dentures difficult or impossible. Dental implants help stop the progressive bone loss and shrinkage of your jawbone by “mimicking” the roots of natural teeth. With dental implant treatment, forget about unsightly partial denture clasps, which place damaging pressure on remaining natural teeth. • An implant-supported denture is completely stable, with no slipping, no rocking and no falling out. There is also no longer any need to use adhesives or to be concerned about teeth that move. • Speaking is much improved as well. • When it comes to eating, your natural teeth absorb biting pressure of up to 540 lbs. per square inch. Long-time denture-wearers can often absorb no more than 50 lbs. per square inch. Dental implants, when properly placed, can withstand 450 lbs. per square inch of biting pressure. • A full upper denture covers the palate of the mouth and reduces the ability to taste foods. When one uses dental implants, the palate is removed from the upper denture so one can taste and enjoy his or her food. • While our New York dentists recommend regular oral hygiene for maintaining good dental health, it is especially important when a patient has received dental implant treatment. Bacteria can attack sensitive areas in the mouth when teeth and gums are not properly cleaned, causing gums to swell and jaw bones to gradually recede. This will weaken dental implants and eventually make it necessary for the implant to be removed. Patients are advised to visit their New York dentists at least twice a year to ensure the health of their teeth and implants.